The Mil Milhas event began on Wednesday with two free practice sessions and then two qualifying sessions, the second at night. Thursday sees two more qualifying sessions. Pirelli tyres arrived at the track a day later than expected, but everything was eventually in place for Wednesday’s track action. At the wheel of GLPK Carsport’s Chevrolet Corvette C5-R, having been fastest in both free practice sessions, Mike Hezemans was again fastest in first qualifying. "This is my first time in Brazil and at Interlagos,” said the Dutchman. “I'm surprised to be the fastest. I was expecting the Mercedes CLK DTM would be two or three seconds faster than us. We have to take care with the Saleen and Ferrari, they are very strong too." Hezemans shares the C5-R with Paulão Gomes, Alencar Júnior and Clemente Lunardi. The second best time of the session was set by the Capuava Racing Mercedes CLK DTM, driven by Stock Car V8 Brazil Champion Giuliano Losacco. The German Touring Car received a special restrictor handicap, the same handicap that last year’s winning team, Medley Genericos with the Audi TT DTM, refused to use in 2006. Konrad Motorsport’s Saleen S7-R, driven by Jean-Marc Gounon, set the third best time. The French GT star helped the Race Promoter, Antonio Hermann, to start near the front. Franz Konrad saw his second car registering the fourth best time. The Austrian will share this Saleen with Robert Lechner and – a forerunner of 2006’s plans? - Tom Weickardt. Three cars missed the first Qualifying. Both Aston Martin DBR9s were not ready in time. The Cirtek Motorsport mechanics were working hard to have the car ready for the night qualification session, and Alcides Diniz's car was struggling with engine cooling. Without the Cirtek Motorsport Aston Martin ready to go, Helio Castro Neves did some laps with Baluarte Racing Team’s Porsche 911 GT3 RS. 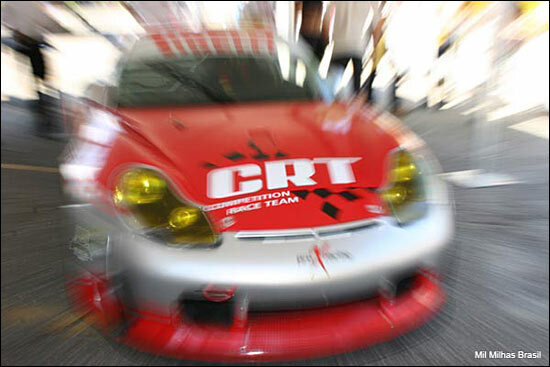 This is the CRT Porsche, sixth in GT2. The Night Qualifying session started quietly, but with Mike Hezemans on top – until GLPK Carsport lost provisional pole to the "made in Brazil" prototype, the ZF-01 (aka R&S MKIII). Felipe Giaffone was the man of the day, as he was a year ago, taking provisional pole for the same team with the same car. The former IRL driver set a very quick 1:32.030, and was 0.556 faster than Mike Hezemans. Paulo Bonifácio and Vítor Meira had an opportunity to drive the prototype, and the team is ready to go faster if necessary. The ZF01 Chevrolet had had a technical problem in the first qualifying session. The Capuava Racing Mercedes CLK DTM improved its time and this entry currently lines up a very close third. 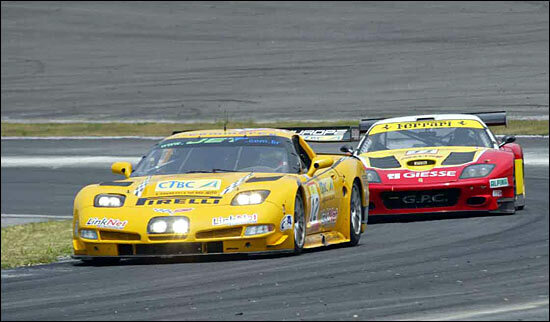 The German car was followed by the two GPC Squadra Corse Ferrari 575 GTCs. Tarso Marques, Thiago Marques and Paulo de Tarso were 0.8s faster than Philipp Peter, Luca Drudi and Angelo Zadra. The two Konrad Saleens were next, with Gounon in front of Lechner. 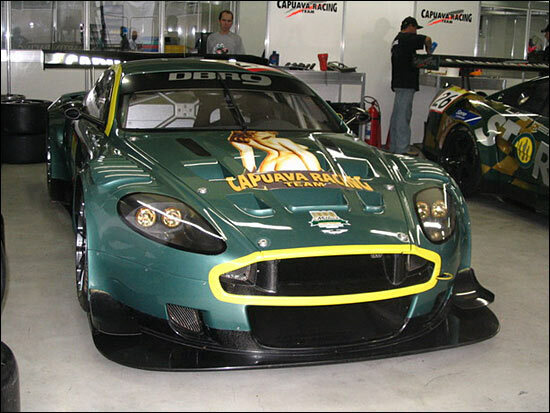 Without an Aston Martin to drive, Pedro Lamy quailified Capuava Racing Team’s Lister Storm in eighth. The local Tekprom Ferrari 550 GTC was ninth. Helio Castro Neves completed the first laps of the meeting in the Cirtek Motorsport Aston Martin DBR9 and completed the top ten. The Anglo-Brazilian team is hoping for a better day on Thursday. Spanish GT Champions PlayTeam SRL, with the Ferrari 360 GTC, are provisionally on the GTP2 (or GT2) pole.